Run DALI at the fastest speed possible with this product. One of the major drawbacks of DALI is its relatively slow speed to that of DMX. "Faster DALI"™ allows for more complex and innovative installations by limiting the DALI data length to a maximum of eight channels - eight times faster. That should mean in order to get 64 channels you need eight converters, which is exactly is what you get all in a single unit. 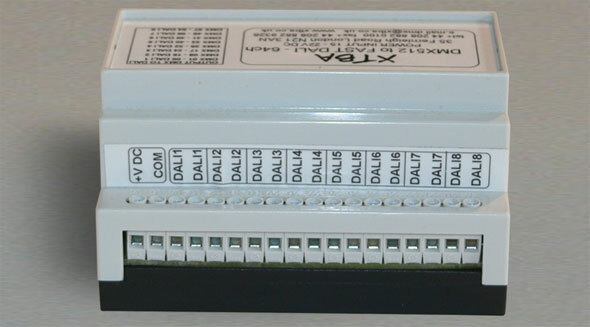 The first of the eight DALI outputs will take the first 8 DMX channels, the second DALI output will take the next 8 DMX channels etc.. By reducing the number of DALI channels transmitted further even greater update speed can be found. Reduce the length to one and DALI can be persuaded to almost keep up with DMX. The unit also has a user selectable output curve to improve the fade profile. 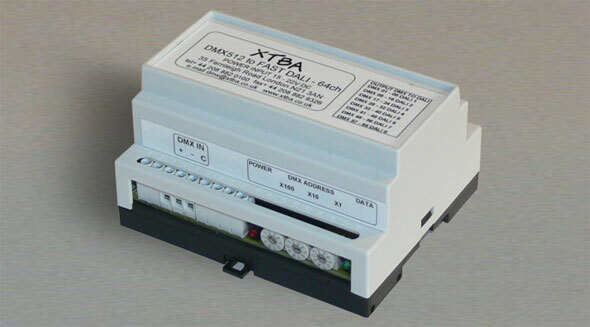 The unit will also drive the DALI ballasts direct without the need of an additional DALI power supply. If you think this is a slightly strange idea we recently supplied 250 custom units to a film lighting company to fit into 8 way fluorescent units. 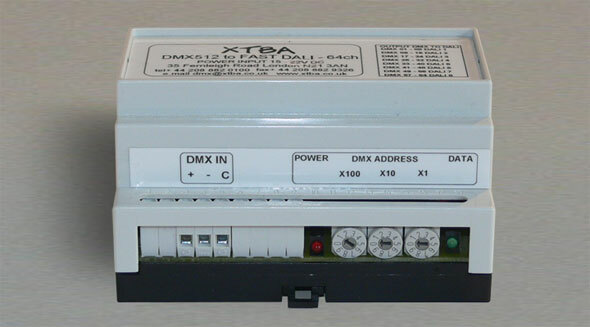 6 DIN Module, Width = 105mm, power & data leds, DMX address switches, ballast programmer on output one. This is now fully RDM Compatible.